Congress has an opportunity to repair our political system and strengthen our Democracy. The For the People Act will restore voting rights, get big money out of politics, and ensure public officials work for public interest. TAKE ACTION TODAY: Call (888)848-4824 and tell Congress to support the For The People Act (H.R. 1). 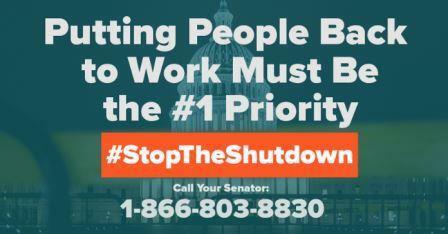 The Government Shutdown continues while over 800,000 federal workers are still without paychecks. Our public service brothers and sisters deserve more from Washington. Take Action & Call Senator Toomey today! Health insurance premiums have increased by over 200% over the past 20 years with costs pushed onto workers like us. Meanwhile healthcare bargaining has become the biggest cause of strikes, lockouts, and concession bargaining for union members. Come see District VP Ed Mooney and labor leaders speak up about why unions are fighting for Medicare for All! 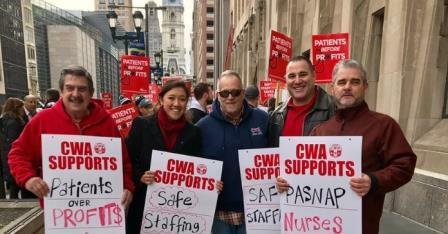 CWA Local 13000 members rallied with the PA Association of Staff Nurses & Allied Professionals (PASNAP) fighting for safe staffing and fair contracts at Hahnemann and St. Christopher's hospitals!